The South Webster Jeeps took a road victory against the Northwest Mohawks Tuesday night in straight sets. 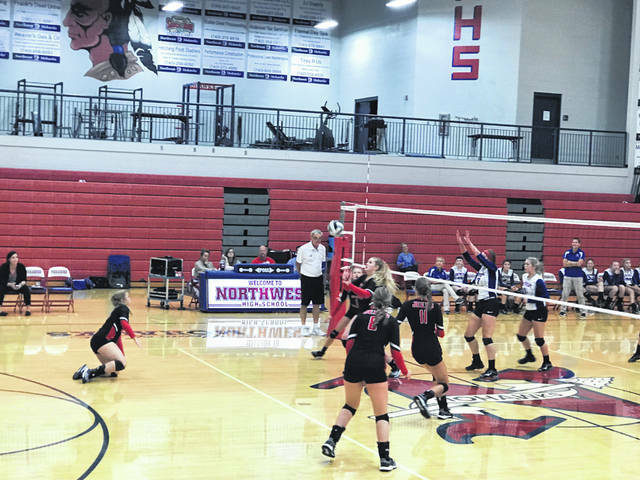 In an SOC volleyball matchup, the Northwest Mohawks played host to the South Webster Jeeps Tuesday night in McDermott. The Jeeps would win the match by sweeping all three sets in their road victory by scores of 25-23, 25-19, 25-12. The first set of Tuesday night’s contest was very back and forth and very hard fought until the very end The Mohawks did a nice job of countering the Jeeps runs until late in the set when South Webster would break the 19-19 tie and take a three score lead at 22-19. Following the next Mohawk point, Jeeps coach Darcee Claxon took a time out to make sure her team knew what to they needed to do in order to close out the set. “Consistency. We have to be consistent” said Claxon, “We have got to quit giving them unearned points. If they are going to get points, it needs to be because they earned it. We have struggled throughout the season just to be consistent and to keep that ball playable. And as the match progressed, we did a good job. We settled in and I thought we were really successful, especially from behind the service line and that really helps.” South Webster would finish the set by scoring three of the next six points scored, giving them the set victory 25-23. The beginning of the second set remained close until the middle of the set when the Jeeps would have their biggest scoring run of the set at 8-1, forcing Mohawks head coach Elizabeth Lewis to use two timeouts during their run. In the end, her efforts to stop the Jeeps run would prove unsuccessful, and the Jeeps would close out the set, 25-19. The Jeeps will next look to face the Oak Hill Oaks tonight in a home match, JV begins at 5:30 p.m. The Mohawks will look for redemption in their match tonight in a road trip to Lucasville to face the Valley Indians. JV for that game will also begin at 5:30 p.m.